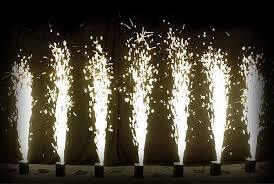 Sparkular cold spark effects are the biggest development in fireworks for decades. They are set to revolutionise the way displays are staged and watched. They produce: 5-metre high fountains that spray up columns of silver sparks which can be programmed to dance in time to music. Outdoors they can be combined with revolving wheels producing swirls of sparkling silver. Have a look at this video sample to see them in action.